Christina and I attended both public meetings hosted by Old Lyme’s Halls Road Improvements Committee, and conducted by members of the Yale Urban Design Workshop. Yale presented the Committee’s vision statement and several conceptual renderings of what fully realizing that vision might yield. The article in the New London Day accurately summarized the vision. The audience was skeptical of the immense breadth and scope of that vision; – requiring twenty- five or more years to complete. Several concerns were raised about cost and the impact on taxes. We left with a few thoughts and concerns. It was not apparent to us that current Halls Road business owners and the professionals occupying office space had participated to any extent in developing that vision. It is absolutely important to get their buy-in. Essex Bank did state that any of their future development would take Old Lyme’s plan into consideration. We found Alan Plattus’ presentation to be a bit glib. This is important stuff, and some of the vision could be lost in presenter style. Also, know the names of our local landmarks, especially if they factor into the plan. (i.e. it’s the “Bow Bridge” that used to cross the Lieutenant River). But, after all; they’re Yale, not Harvard. Our suggestion: parse the plan into achievable shorter- range projects that will yield some early successes. Start with the hiking/biking paths along the Lieutenant River, rebuild the foot bridge, and create the new Halls Road village green. I am writing in part to fulfill a promise to a daughter. Our daughter Erin arrived for the Christmas holidays from North Carolina with an adolescent Hungarian vizsla pup. She walked Daisy a few times each day; and always with a doggie waste disposal bag in her pocket. She commented on the large amount of pet waste that she encountered on her walks and wondered why Old Lyme hasn’t required, – or at least encouraged – pet owners to “police” their dog’s waste. I do not know that this problem is widespread or endemic in our town, nor will I attempt to quantify the issue. It is noticeable. I assume that residents are largely cleaning up after their pets. However, the (hopefully) minority of dog owners who are so discourteous to their neighbors that they don’t bother to bag and dispose this waste, are leaving an unsightly and unhealthy memorial of their pet’s exercise. Erin’s professional career has been principally in Boston/ Cambridge, MA and the United Kingdom. These places have longstanding strongly enforced ordinances regarding removal and disposal of pet waste. So, she may react to such misbehaviors earlier than many would. I am not advocating that Old Lyme enact an ordinance regarding pet waste. Rather, I feel that we should communicate the problem better and continue with our Tennessee Williams – type approach to resolution i.e., with apologies to T.W., we should always depend on the kindness of neighbors. The problem is not insignificant; dog mess is not only an eyesore, but also a health hazard. In the extreme, according to the CT Department of Energy and Environmental Protection (DEEP) and the Environmental Protection Agency (EPA), dog waste is a major pollutant and contaminant of the water supply. It is a serious health issue. In fact, it is estimated that 1/3 of all water contamination is a result of dog waste run off entering streams and leaching into underground well water. The EPA deemed dog waste a “non-point source of pollution”, which puts it in the same category as oil and toxic chemicals. So, picking up after your pet every single time is important. I’ll summarize the “How”: Always carry a plastic bag with you when you walk your dog. Using the bag like a glove, you pick up the waste, turn the bag inside out around the waste, tie it in a knot and dispose of it in a trash can. LymeLine.com is publishing a series of articles in association with Old Lyme’s Solid Waste and Recycling Committee — these articles lay out best recycling practices. Previous articles have covered Old Lyme’s current curbside trash and recycling program; the safe disposal of medications; the recycling of paint, and the recycling of mattresses. In this article we cover the more complex topic of managing electronics at the end of their useful life; i.e., what should we do with our e-waste? The topic is especially pertinent right now because — I’m certain — that more electronics move in and out of our homes during the holidays than at any other time of the year. Proper disposal of e-waste is a very significant issue. According to the Environmental Protection Agency (EPA), more than 2.5 million tons of e-waste are produced each year in the United States. The majority is not recycled, so most of our discarded electronics are ending up in landfills; the EPA estimates that less than one in 10 mobile phones is recycled, and only about 25 percent of all e-waste is collected for recycling. If you’re checking the math, some of the rest gets donated; but according to EPA pundits, almost three quarters of computers sold in the United States end up stockpiled in garages, basements, and closets waiting to eventually enter the disposal stream. Our e-waste contains materials that are toxic if improperly handled at disposal. These toxic chemicals, which can leach into the soil over time or be released into the atmosphere, include cadmium, lead, mercury, hexavalent chromium, and brominated flame retardants. Incineration releases these heavy metals into the air. Mercury released into the atmosphere can bio-accumulate in the food chain, particularly in fish, a major route of exposure for the general public. If the products contain PVC plastic, highly toxic dioxins and furans are also released. Moreover, electronics are made with valuable resources like precious metals, engineered plastics, glass, and other materials — all of which require energy to manufacture. When equipment is discarded, these resources cannot be recovered and additional cost is incurred to manufacture new products from virgin materials. Further, lanthanides, also known as rare-earth elements, are used to make magnets found in computers, cell phones, and many other consumer “gadgets.” Until recently, China was the main producer of these raw materials, giving that country an advantage in setting market prices. As a result, the U.S. Department of Energy developed an initiative to recover lanthanides from electronic waste. It was/is common practice for developed countries to export their e-waste to developing countries, which may not have the resources to safely recycle and dispose of used electronics. In the United States it is estimated that about a quarter of the waste collected for recycling is still being exported in this manner. In 2001, the Basel Action Network (BAN), a non-governmental environmental organization based in Seattle, led an investigation of e-waste processing in China, India, and Pakistan. The investigation, which included sophisticated electronic tracking of recycled televisions, uncovered an entire area northeast of Hong Kong where migrant workers were employed breaking apart obsolete computers imported primarily from North America. The workers, who included children, were not using contemporary safety and anti-contamination precautions. BAN is named after the 1989 Basel Convention, a United Nations treaty designed to control and prevent the dumping of hazardous waste from developed to less developed countries. BAN serves as a watchdog and promoter of the Basel Convention and its decisions. Such dumping is actually “legal” in the United States because this country has not ratified the Basel Convention; although as of July 2016, 183 nations and the European Union were already parties to the Convention. Haiti and the United States have signed the Convention but not ratified it. There is still no federal law that requires the recycling of electronic waste or prohibits it from being exported to developing countries. There have been some efforts in Congress to pass a bill that would make overseas dumping of toxic e-waste illegal, but the Responsible Electronics Recycling Act (RERA) has been stuck in the House for more than two years. Consequently, individual states began to take action. California passed an electronics recycling law in 2003, the first state to do so. Connecticut passed its law in 2007, and 27 other states and the District of Columbia have since followed suit. Connecticut’s electronics recycling law requires electronics manufacturers to pay for the cost of recycling. This is another example of the producer responsibility or product stewardship principle, which requires that those involved in production take responsibility for the safe disposal of a product. However, unlike mattresses and paint, which were covered in past articles, where the consumer pays a fee at the time of purchase to support the recycling program, Connecticut’s law requires manufacturers to finance the transportation and recycling of these electronics. It also requires recyclers of electronics to be approved and monitored by the CT Department of Energy and Environmental Protection (DEEP). The local drop-off location for recycled residential electronics is the Old Lyme Transfer Station on Four Mile River Rd. There is no charge for drop off. 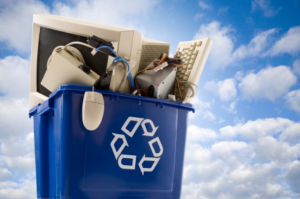 Large electronics retailers like Best Buy and Staples also have recycling programs in place. tablets, and e-readers with a video display greater than 4 inches. In contrast, e-waste from non-residential sources (i.e., commercial, governmental, retail, etc.) is regulated under current federal and state hazardous waste and solid waste laws and should not be dropped off as recycled residential electronics. DEEP-approved recyclers then pick up these CEDs from the various Connecticut collection points. The recyclers then sort the computers and monitors by manufacturer and submit a bill to the responsible manufacturer for the cost of transporting and recycling those CEDs with the manufacturer’s brand name on them. Television manufacturers will pay a percentage of the total cost of recycling televisions equivalent to their market share. Recyclers then submit bills to manufacturers for covered costs. Under Connecticut’s recycling program, approved recyclers are required to establish data security practices. They must secure hard drives until such point that they are physically destroyed for recycling. If they intend to reuse or resell the computer, they must erase (“wipe”) the hard drive to a Department of Defense standard. If you are concerned about data security, you can erase the hard drive prior to dropping off the device for recycling. There are several ways to erase a hard drive. It is possible to perform this yourself at home, but it may be a bit complicated for those not facile with desktop computing. Paraphrasing recent political history, it’s not just “Like with a cloth or something?” Retailers like Best Buy and Staples may also perform this task, but for a charge. About a month ago Staples in Old Saybrook quoted a price of $29.99. Our next article will cover the recycling of tires, and bulky items like appliances and furniture. If you have questions or comments, contact: Leslie O’Connor at alete1@sbcglobal.net or Tom Gotowka at TDGotowka @aol.com. LymeLine.com is pleased to be publishing a series of articles written by Old Lyme’s Solid Waste & Recycling Committee that lay out best recycling practices. To date, the committee’s articles have covered Old Lyme’s curbside trash and recycling programs; the safe disposal of medications; and paint recycling. This article covers the recycling of mattresses and box springs. The International Sleep Products Association (ISPA), which is the trade association for the mattress industry, estimates that 35 to 40 million new mattresses and box springs are sold in the United States every year, and at least 15 to 20 million are discarded. Unfortunately, mattresses are really hard to throw out; there is just no easy way to dispose of them. They are difficult to land-fill because they can’t be easily compressed and crushed; they pose challenges for incinerators. Connecticut passed comprehensive mattress stewardship legislation in 2013 (the first state to do so.) Similar to paint, the law requires mattress manufacturers to establish programs to manage unwanted mattresses and box springs; and, like paint, a fee is assessed at the point of sale to fund the program. California and Rhode Island have since passed similar mattress stewardship laws. The Mattress Recycling Council (MRC) was formed by ISPA to operate recycling programs in the states that have such laws. Connecticut’s program launched in May, 2015. “Bye Bye Mattress” (really!) is the recycling program established by MRC. They provide haulers that pick up and transport mattresses and box springs from drop-off sites to recycling centers. Our local drop-off site is Old Lyme’s transfer station. There are currently mattress recycling facilities in East Hartford and Bridgeport; ours extends to East Hartford. Mattresses get recycled through the state’s recycling program regardless of when they were purchased. Note that most mattress retailers will remove your old mattress on delivery of new. The industry estimates that nearly 90 percent of used mattress and box springs’ components can be recycled — the metal springs, foam, wood and fibers — and made into new useful products. Before putting this topic to rest, it’s worthwhile to mention the issue of bed bugs. Infested mattresses require special handling. If you have concerns regarding bed bugs you can find information and guidance from Connecticut’s Department of Energy and Environmental Protection at http://www.ct.gov/deep/cwp/view.asp?a=2714&q=482160&deepNav_GID=1645%20#BedBugs or the Connecticut Coalition Against Bed Bugs at http://www.ct.gov/caes/cwp/view.asp?a=2826&q=437580. Our next few articles will cover the proper recycling of electronics, tires, and bulky items like appliances and furniture. If you have questions or comments, contact Leslie O’Connor at alete1@sbcglobal.net or Tom Gotowka at TDGotowka@aol.com. LymeLine.com is pleased to be publishing a series of articles written by Old Lyme’s Solid Waste & Recycling Committee that lay out best recycling practices. To date, the committee’s articles have covered the town’s current curbside program, and the safe disposal of prescription and over-the counter medications in previous articles. This article covers paint recycling. The U.S. Environmental Protection Agency estimates that about 10 percent of all paint purchased in the United States is left-over – around 64 million gallons annually. This left-over and unused paint can cause pollution when disposed of improperly and, in the past, was costly for municipalities to manage. So, Connecticut enacted a paint stewardship law in 2011, which required that paint manufacturers assume the costs of managing unwanted latex and oil-based paints, including collection, recycling, and/or disposal of unwanted paint products. Connecticut was the third state in the country to pass paint legislation, following Oregon and California. As a result of the paint stewardship law, a non-profit program was rolled out in 2012 by the American Coatings Association, which is a trade group of paint manufacturers. The program is funded by a fee paid by the consumer at the time of purchase. “PaintCare” has resulted in a network of drop-off locations for that left-over paint (now 142 sites in the state.) Locations near Old Lyme include Sherwin Williams in Old Saybrook, True Value Hardware in East Lyme, and Rings End Lumber in Niantic. PaintCare now operates in the nine states that have enacted paint stewardship laws. There is no charge at the drop-off site. As noted, the program is wholly funded by fees assessed at the point of sale. PaintCare drop-off sites accept latex and oil-based house paints, primers, stains, sealers, and clear coatings like shellac and varnish. All of these must be in the original container (no larger than five gallons) with the original printed label and a secured lid (i.e., no open or leaking containers.) They do not accept aerosols, paint thinners, mineral spirits, and solvents. You should review the PaintCare website (http://www.paintcare.org) before loading your trunk with your left-over paint. The site has a complete list of accepted and non-accepted paint products and any drop-off limits. What happens to the excess paint after drop-off? PaintCare’s haulers move the paint from the drop-off sites to their facility for sorting. Their goal is to then recycle as much as possible according to a policy of “highest, best use”. Most of the oil-based paint is taken to a plant where it is processed into a fuel and then burned to recover the energy value. Clean latex paint (i.e., not rusty, dirty, molding or spoiled) is sent to recycling facilities and reprocessed into “new” paint; most latex paint that doesn’t contain mercury or foreign contaminants can be processed into recycled-content paint. There are two types of recycled paint: re-blended and re-processed. Re-blended paint contains a much higher percentage of recycled paint than re-processed paint (which mixes old paint with new paint and other new materials). Paint that is nearly new and in good condition is given to charitable organizations for re-sale. Habitat for Humanity’s ReStores also accept clean surplus paints. According to the PaintCare 2014 Annual Report, 240,798 gallons of used paint were collected in the first year of the program; 81 percent of the latex paint was recycled into recycled-content paint, 4 percent ended as a landfill cover product, 6 percent was fuel-blended, and 9 percent was unrecyclable and sent to landfill as solids. All of the oil-based paint was used for fuel. Our next article covers the recycling of mattresses. If you have questions or comments related to this article or recycling in general, contact Leslie O’Connor at alete1@sbcglobal.net or Tom Gotowka at TDGotowka@aol.com. Old Lyme’s Solid Waste & Recycling Committee is exploring ways to improve recycling in Old Lyme. We are publishing several articles that lay out best practices. Our first article reviewed Old Lyme’s current curbside program. This article covers the safe disposal of prescription and over-the counter medications. Note that we sometimes refer to “DEEP” (The Connecticut Department of Energy and Environmental Protection)as a source of information. First, never flush your unwanted medications down the sink or toilet; they pass through septic systems and sewage treatment plants essentially unprocessed. Flushed medications can get into our lakes, rivers and streams. Of real concern, a nationwide study done in 1999 and 2000 by the United States Geological Survey (USGS) found low levels of antibiotics, hormones, contraceptives and steroids in 80 percent of the rivers and streams tested; further, research has shown that such continuous exposure to low levels of medications has altered the behavior and physiology of fish and other aquatic organisms. Occasional drug collection events sponsored by the Town or community organization. Locally, watch for the Annual Drug Take Back Day sponsored by Lyme’s Youth Services Bureau. Some police stations have a drop box drug disposal program where residents can anonymously discard unwanted or unused medications. Both the Clinton and Waterford Police Departments participate in the drop box program. A complete list of locations can be found at this link. Some chain pharmacies (e.g., CVS, Walgreens, Rite Aid) have disposal envelopes for prescription and over the counter drugs available for purchase; check with your pharmacy for details. If the above doesn’t work for you, Connecticut’s Department of Consumer Protection suggests that you dispose of drugs in your household trash (where it will ultimately be incinerated) as follows: add hot water to dissolve the contents, or cover the contents with some noxious or undesirable substance; re-cover and place it all inside another larger container to ensure that the contents cannot be seen, and tape it shut. unwanted pet medications should also be disposed as described above. disposal of sharps: residents who are required to use injectable medications (e.g., insulin) can safely dispose of used needles and lancets by placing them in a puncture-proof, hard plastic container with a screw-on cap (like a bleach or detergent bottle). Tightly seal the container with the original lid and wrap with duct tape. Discard in a bag in your trash. Do not mix sharps with prescription drugs. Some medications (e.g., chemotherapy drugs) require special handling; DEEP’s website provides more detail on disposing of such drugs and other medical supplies at this link. This article covers methods for safe disposal of prescription and over-the-counter medications. Our next article will cover the recycling of paint. Old Lyme’s Solid Waste & Recycling Committee meets monthly. If you have questions or comments, contact: Leslie O’Connor or TDGotowka@aol.com. Curbside recycling by Old Lyme residents has become very routine. However, there is some evidence that many recyclables end up in the blue trash bin rather than the green recycling bin. So, to reduce those missed opportunities, the Town has appointed a Solid Waste and Recycling Committee, which will investigate and identify ways to improve recycling in Old Lyme. We plan to publish – with LymeLine.com‘s assistance – several informational articles that lay out best practices. This first piece provides an overview of our current curbside program. First, it’s the law! Connecticut implemented a mandatory recycling law in 1991; the law applies to all Old Lyme residents, every business in town. and all public and private agencies and institutions (e.g., schools); and applies, regardless of whether you rent or own, or whether you live in single or multi-family residences. Second, and perhaps more importantly, it just makes good sense. A typical household produces nearly five pounds of solid waste each and every day. Only about a pound of that gets recycled. So, that’s about ¾ ton of trash per household per year that ends up burned or buried. Connecticut must dispose of almost 2.5 million tons of trash every year. Clearly, the more that we recycle, the less that trash and garbage ends up in our landfills and incineration plants. Recycling enables recovery and re-use of potentially valuable materials – turning what would otherwise be treated as waste into valuable resources. In 2011, Old Lyme implemented single stream recycling to streamline recycling for residents and, since then, all recyclables can be placed, unsorted, in the green recycling bin. Many of you probably remember the old 14-gallon blue recycling boxes which required separation of glass, paper, metal, & cardboard. Residents can now recycle more at each pickup. We must recycle: all paper, cardboard; paperboard (e.g., cereal boxes & egg cartons); glass; aluminum food cans and foil; juice and milk cartons; non-deposit plastic soda bottles and cans; detergent bottles; empty aerosol cans; and all plastic labeled #1 to #7. There are more details at: http://oldlymesanitation.com/. What should not be placed in your green bin? Do not put any trash; plastic grocery bags; needles or syringes; Styrofoam; shipping peanuts; or food waste in your green bin. Never throw grass clippings or yard waste in the trash. Flatten your cardboard before placing it in the bin. All recycled containers (cans, bottles, jars, etc.) must be empty and rinsed clean (You do not need to remove the labels). You should redeem your deposit bottles and cans at your supermarket rather than placing them in the bin. 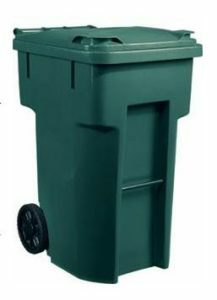 Recyclables should be placed dry and loose directly in the green bin (do not put them in plastic bags). Greasy pizza boxes are not recyclable. The plastic container code (the number inside the chasing arrows symbol) identifies recyclable plastics #1 to #7. What do I do with all these plastic super market bags? – Just say “paper”? Plastic bags should never be put in your green recycling bin because they can jam equipment at the facilities that prepare recyclables to be marketed. Many Connecticut supermarkets have collection receptacles for plastic bags at the store and they will then be recycled. Really, the simplest solution is to just bring reusable bags with you when you go shopping. Most of us have a back seat full of those reusable bags. How successful have our recycling programs been? Connecticut has a goal of reducing, reusing and recycling 58 percent of our municipal solid waste by the year 2024. The State’s goal incorporates everything included in Old Lyme’s recycling program. Our current rate is in the range of 25 – 32 percent. The State of Connecticut rate is currently below 30 percent. This article outlines Old Lyme’s current recycling program. Subsequent articles will cover areas that fall outside the curbside program (e.g., bulky items like mattresses and furniture; appliances and electronics; unused prescriptions; and paint and hazardous waste). We’ll discuss the economic costs and benefits of recycling, and review what currently happens to your trash and recycling after it leaves your bin; and provide suggestions for better recycling practice, which will bring Old Lyme closer to Connecticut’s goal. Old Lyme’s Solid Waste & Recycling Committee meets monthly. If you have questions or comments, contact: alete1@sbcglobal.net or TDGotowka@aol.com. The recycling section of the Town’s website is also a good source of information.